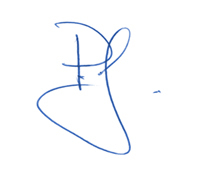 Downturn for What? | DiNuzzo Index Advisors, Inc.
On Tuesday morning, Wall Street traders woke up to something they haven't experienced much of lately: actual market volatility. 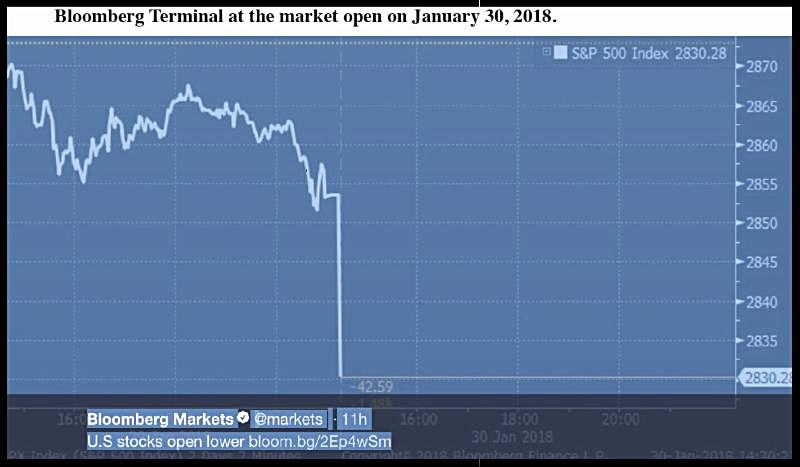 One trader posted an image of his Bloomberg terminal at the market opening (re-posted here), which showed an immediate scary-looking plunge in U.S. equities as the opening bell rung. By the end of the day, American stocks were down more than one percent, the worst one-day loss since last August, and capping the largest two-day loss since last May. What's going on? Are U.S. stocks really a full percentage point less valuable today than they were yesterday morning? By the end of the day, it was clear that much of the drop came from a handful of U.S.-based healthcare companies, whose stocks had been unloaded by spooked traders. Why? There had been an announcement by Jeff Bezos of Amazon, Warren Buffet of Berkshire Hathaway and Jamie Dimon of JPMorgan Chase, Inc. that they were thinking about forming a new independent healthcare provider. The chart shows how the market prices of these companies fell as a result of this new, still-hypothetical competition. 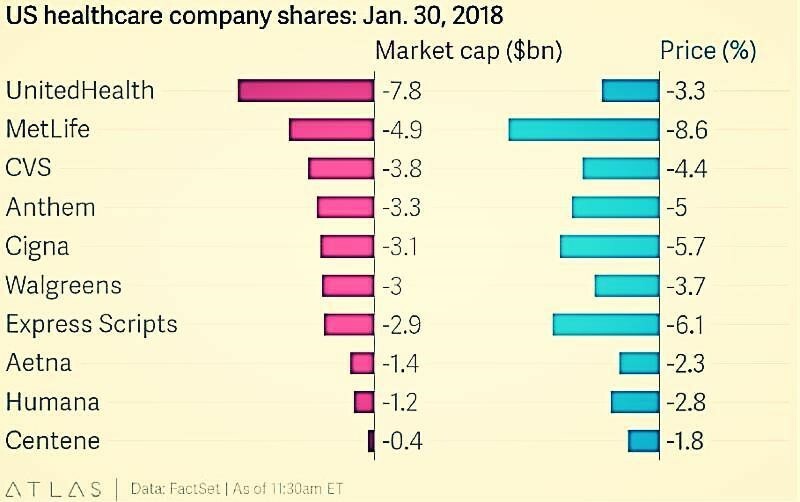 What it doesn't show is that these companies, collectively, saw their total worth-measured by the value of shares outstanding-drop $30 billion in roughly two hours of trading. Did this make sense? Surely not. Experienced stock pickers were basing their decision to sell, sell, sell on how Amazon totally disrupted retail investing. JPMorgan Chase has enormous financial clout and Warren Buffett is a legend in the investing world. But the "plan" they announced was really more of an intention to create a plan, and it was uncertain whether the new disruptive high-tech healthcare provider would be available to mainstream Americans or just the employees of three very large companies that desperately want to reduce their health insurance costs.